In Season 1 of the NBC crime drama Aquarius, the audience meets the show's fictionalized version of real-life serial murderer Charles Manson. But he isn't that yet. Season 1's Manson is a captivating leader who inspires intense loyalty among lost followers looking for some kind of purpose. And, he's an aspiring musician. The Season 2 premiere of Aquarius puts Manson in the path of a rock star with the clout to get him some of that recognition he's certain he deserves. Charles Manson befriends Dennis Wilson from the popular '60s rock group The Beach Boys in the two-hour episode "Helter Skelter." 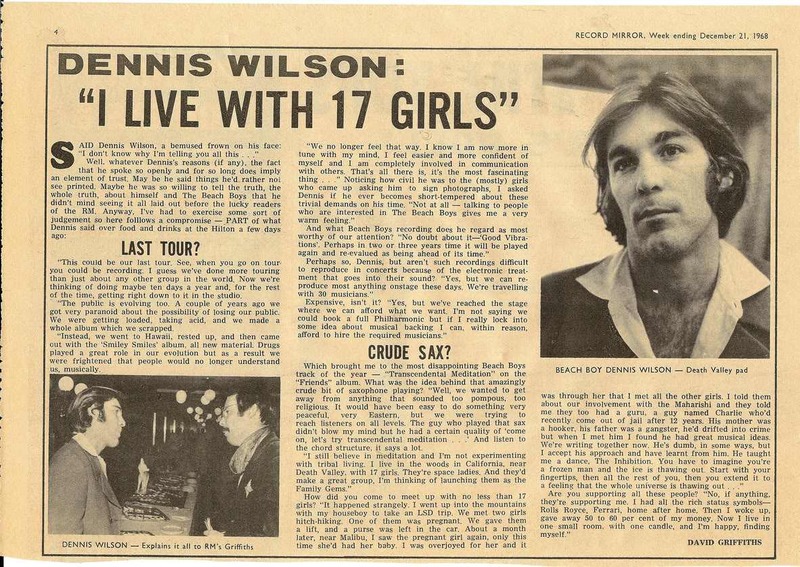 But, did Manson know Beach Boys member Dennis Wilson in real life? In Aquarius, Emma tags along with new Manson Family member Patty to the home of a friend's sometimes-boyfriend. He's in the music business, Patty says, and may be able to get Manson's songs heard. The girls party and sleep with the fictionalized version of The Beach Boys drummer at his home and bring Manson over with them on another day. In real life, the two men did know each other. Wilson once described their initial meeting to the Record Mirror in 1968, which came via a group of women. "I told them [the girls] about our involvement with the Maharishi and they told me they too had a guru, a guy named Charlie who'd recently come out of jail after 12 years," Wilson told the paper. "He drifted into crime, but when I met him I found he had great musical ideas. We're writing together now. He's dumb, in some ways, but I accept his approach and have learnt from him." According to VH1, The Beach Boys even reportedly recorded one of Manson's songs. Originally titled "Cease To Resist" (which is also the name of an Aquarius Season 1 episode), the band allegedly reworked the song and called it "Never Learn Not To Love." In an interview with TMZ, friend-of-the-band John Stamos said because of the ties, the Beach Boys don't play that song anymore. Bustle reached out to The Beach Boys for comment on Wilson and Manson's friendship and the claims that the band recorded Manson's song, but has not yet received a reply. One day, Charles Manson brought a bullet out and showed it to Dennis, who asked, ‘What’s this?’ And Manson replied, ‘It’s a bullet. Every time you look at it, I want you to think how nice it is your kids are still safe.’ Well, Dennis grabbed Manson by the head and threw him to the ground and began pummeling him until Charlie said, ‘Ouch!’ He beat the living sh*t out of him. ‘How dare you!’ was Dennis’ reaction. Charlie Manson was weeping openly in front of a lot of hip people. I heard about it, but I wasn’t there. The point is, though, Dennis Wilson wasn’t afraid of anybody! Before Manson and Wilson severed ties, Manson met music producer Terry Melcher through Wilson. The Guardian reported that Manson was allegedly enraged when a record deal he was pursuing with Melcher fell through. He planned to get his revenge, but Melcher was no longer living at the Cielo Drive address Manson's followers broke into in August of 1969. Instead, the Family brutally murdered its occupants, including pregnant actress Sharon Tate, according to The Guardian. After that, Manson gained national spotlight during his and his Family's murder trials and convictions. Rolling Stone reported that Wilson, who had distanced himself from Manson prior to those murders, went on with his life before his death by drowning at Marina Del Rey in 1983.